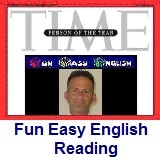 ﻿ Fun Easy English - reading practice and learning about the holiday Presidents Day. Presidents' Day is a United States federal holiday celebrated on the third Monday in February. Hi. In the classroom today you will learn about Presidents' Day. The holiday was originally implemented by the federal government of the United States of America in 1880 for government offices in the District of Columbia. It was expanded in 1885 to include all federal offices. As the first federal holiday to honor an American citizen, the holiday was celebrated on Washington's actual birthday, February 22nd. On January 1st, 1971 the federal holiday was shifted to the third Monday in February by the Uniform Monday Holiday Act. In the late 1980s, with a push from advertisers, the term "Presidents' Day" began its public appearance. The theme has expanded the focus of the holiday to honor another President born in February, Abraham Lincoln, and often other Presidents of the United States. The presidents of the United States are honored in many other ways. Mount Rushmore National Memorial is located near Keystone, South Dakota. Mount Rushmore is a monumental granite sculpture which represents the first 150 years of the history of the United States of America. The following four presidents are honored. Approximately two million people visit this memorial each year. This is an important federal holiday in the United States of America. Be sure to watch the movie trailer below and see the way a president should be when leading a country. This is one of my favorite movies. The American President. The American President is a 1995 romantic comedy starring Michael Douglas, Annette Bening, Martin Sheen, Richard Dreyfuss and Michael J. Fox. In the film, President Andrew Shepherd (Douglas) is a widower who pursues a relationship with attractive lobbyist Sydney Ellen Wade (Bening) - who has just moved to Washington, D.C. - while at the same time attempting to win passage of a crime control bill. The following video is a trailer (preview) for the movie. Try to understand as much of the movie trailer as possible. 1. Presidents' Day is celebrated on which day? 2. Which of the following is true about Presidents' Day? 3. The holiday was originally implemented in which year? 4. Presidents' Day is the first federal holiday to honor which of the following? 5. What shifted the holiday to the third Monday in February? 6. Where is Mount Rushmore National Memorial located? 7. What is Mount Rushmore? 8. What does Mount Rushmore represent? 9. Which four presidents are represented on Mount Rushmore? 10. How many people visit Mount Rushmore each year?